Good Morning and welcome to my very own Tasty Tuesday! I have decided that I will share one of my favorite recipes with you on Tuesdays...some old and some new! For some reason I am not always able to link to past recipes so just might repeat some of those for you. Today's recipe is a family favorite and works really well on my "fast days" when I only eat 500 calories for the whole day. The pot above is a 2 1/2 gallon stock pot and is nearly full so if you have a small family or don't want to eat soup ALL week, you might want to cut the recipe in half. The soup is called All-You-Can-Eat Soup Diet Basic Recipe and I got it from RealAge and they got it from Good Housekeeping. The Good Housekeeping link will take you to a printable copy of the recipe with nutritional information. 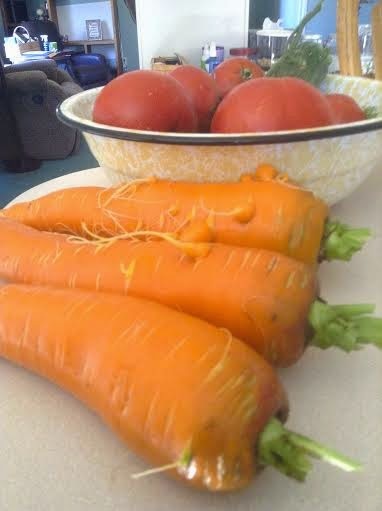 These are the carrots I dug from our garden today. They were nearly one pound EACH!!! Oh my! A little side note here, dogs LOVE cooked carrots! They are dog candy. If you doubt me, try it but be careful or your dog will take your hand off with the carrot! Coat 12-quart stockpot (or 2 large saucepans) with nonstick cooking spray or just a little bit of Olive Oil. Over medium-high heat, add carrots, onions, celery and garlic; cook 8 minutes or until vegetables soften, stirring occasionally. Add tomatoes with their liquid, breaking up tomatoes with side of spoon. Add cabbage, green beans, broth, water, salt and pepper; heat to boiling over high heat, stirring occasionally. Reduce heat to low; cover and simmer 10 minutes, stirring occasionally. Increase heat to high, stir in zucchini and spinach and heat to boiling. 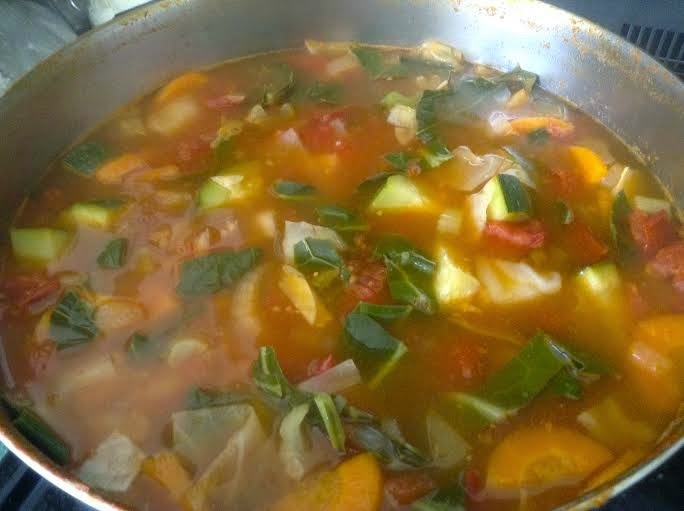 Reduce heat to low; cover and simmer 10 minutes or until all vegetables are tender. Each cup of soup has 45 calories and 1 gram of fat! Note: for a heartier soup we add potatoes, cut in chunks; canned beans; barley and/or corn. I hope you enjoyed Tasty Tuesday and I look forward to your comments! Have a great day! It's so nice to have you back! 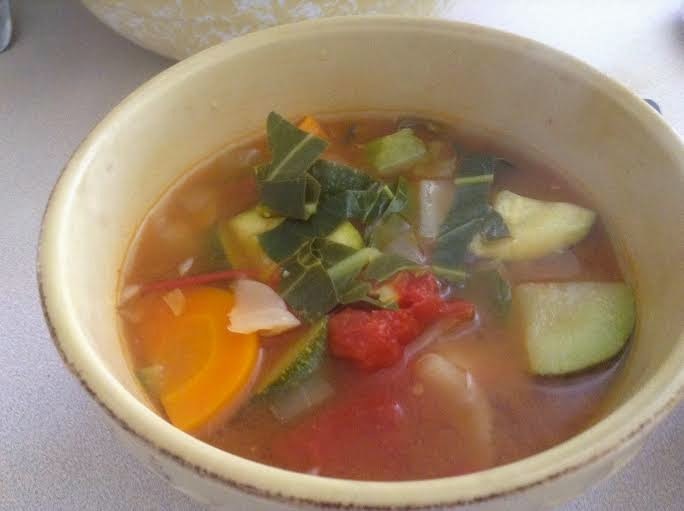 The soup looks delicious and just the right season for soups again. Also, your afghan is lovely...lucky mom and baby. Thank you so much! So glad to know I was missed:) Love soups when it starts cooling off although we are having a warm week here. Lots of vitamins and minerals and very few calories! Thanks for stopping by William!